Autograph Collection Hotels, Marriott International’s distinctive collection of passionately independent hotels, invites travellers to uncover the beauty of the Southern California coastline with its road trip packages. 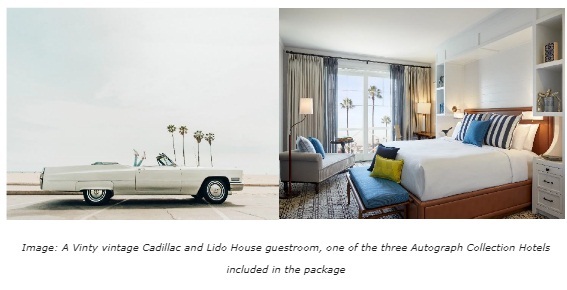 The curated packages are available from November through January 2019 at the brand’s three newest West Coast destinations: westdrift Hotel in Manhattan Beach, Lido House in Newport Beach and Hotel Republic in San Diego. Each hotel was hand-selected for Autograph Collection Hotels’ portfolio for its vision, design and craft, as well as the role it plays in its respective locale. In collaboration with Vinty, the premier classic car hire service in California, the road trip packages provide travellers with the opportunity to rent one-of-a kind vintage cars to drive along the iconic Pacific Coast Highway and find retreat at one or more of the brand’s newly opened hotels. An exclusive rate on a three-day Vinty vintage car rental (including petrol, pick-up/drop-off, vehicle selection) and complimentary on-property valet parking. A one-of-a-kind illustrated road map outlining off-the-beaten-path experiences for guests to explore throughout their trip, curated by Autograph Collection Hotels. The packages also include access to the Black List audible Table Reads for entertainment throughout the journey, as part of Autograph Collection Hotels’ Indie Film Project – a multi-faceted platform in partnership with the Black List designed to support the art of storytelling by shining a light on today’s most talented indie filmmakers. The Table Reads takes the best and most exciting screenplays Hollywood hasn’t yet made, and turns them into movies, for your ears. Taking cues from the beach city founded by a New Yorker, the 10 hectare westdrift Manhattan Beach is an exacting mix of ‘Endless Summer-meets-Eastern Seaboard,’ combining iconic design, amenities and culinary offerings that speak to both coasts. Designed by San Francisco-based EDG Design, westdrift features 393 coastal-infused luxury guest rooms and suites, all with stunning views and 112 of which feature private balconies. More than 35,000 square feet (approx. 3,251 square metres) of indoor-outdoor space includes Jute Coastal Bar + Kitchen, which is anchored by a 360-degree bar. At the nexus of Lido Isle, Lido Peninsula and Balboa Peninsula, the 130-room Lido House celebrates Newport Beach’s vibrant city, bustling marina and white-sand beaches. Set on the site of the former City Hall, this hotel seamlessly blends classic Cape Cod-style architecture with nautical-inspired details to create an icon of sophisticated coastal style. Five tri-level private cottages provide the ultimate respite for relaxation, imparting guests with the privacy of a home with the amenities of a luxury resort. In addition to The Mayor’s Table restaurant and Topside rooftop bar and lounge, the hotel features a sun-kissed pool with vibrant courtyard and Boost Spa, focusing on energetic treatments. From the picture-perfect rooftop bar to the sea-inspired guest rooms, Hotel Republic embodies San Diego’s laid-back ethos. Hotel Republic takes design cues from San Diego’s Oceanside location, with lofty ceilings and chandeliers made from reclaimed driftwood. Coastal inspiration continues in the guest rooms, furnished in contemporary neutral tones accented by blue tie-dyed pillows. Guests can take in San Diego’s bustling Downtown district from the hotel’s stylish rooftop lounge, where craft cocktails and light fare pair perfectly with breathtaking city and ocean views. The packages are available through January 2019 and accommodates one to four guests. Rates start at $4,898 (approx. AUD$6,825) at westdrift, $4,204 (approx. AUD$5,858) at Lido House and $3,300 (approx. AUD$4,598) at Hotel Republic. To book the California Road Trip Package, please visit www.westdrift.com, www.lidohousehotel.com, and/or www.hotelrepublicsd.com. For more information about Autograph Collection Hotels, please visit www.autographhotels.com.